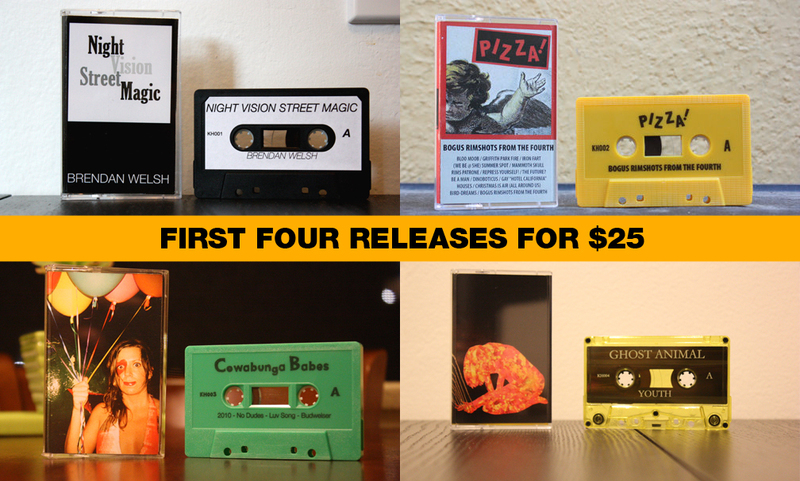 Now through the end of February, you can purchase our first four releases for $25 if you reside in the United States and Canada and $33 if you live overseas. Shipping is included in these prices. Already own a Kill/Hurt release? No problem! Just indicate at checkout how many of each tape you’d like us to send. Default orders will include one copy of KH001, KH002, KH003 and KH004. KH005, Computer Magic’s Get a Job, is not included in this package and we are unable to substitute KH005 for any of the first four releases. Since we only have a limited number of certain releases, we can only offer 3 bundle packs for sale. UPDATE: We can no longer offer the bundle pack for sale. This entry was posted in BRENDAN WELSH, COMPUTER MAGIC, COWABUNGA BABES/THE ZOLTARS, GHOST ANIMAL, KILL/HURT, SALE, TAPES.